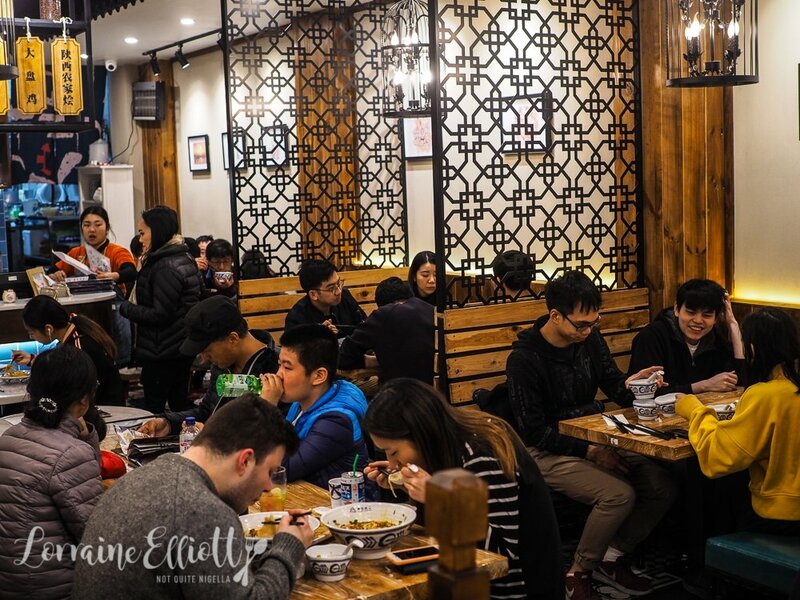 Burwood is a suburb replete with Xi'an eatiries. 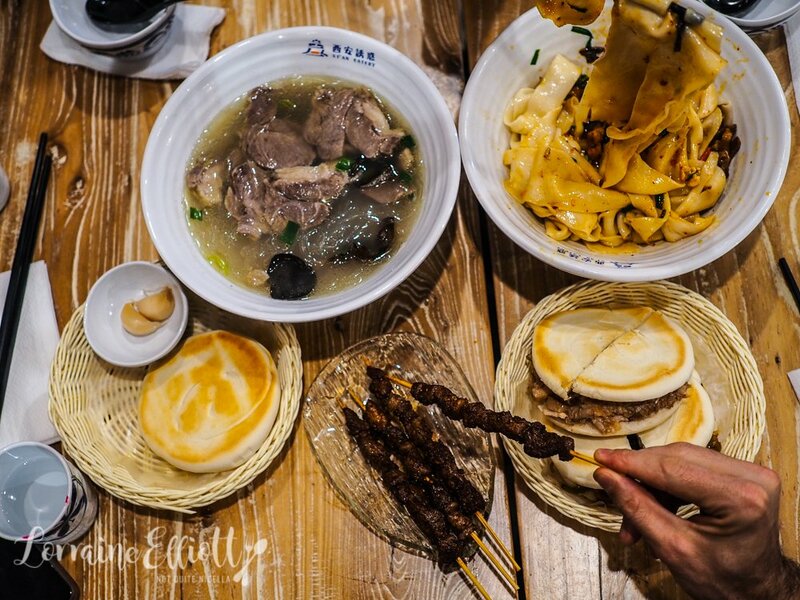 This area in central China at one end of the Silk Road specialises in spicy food. 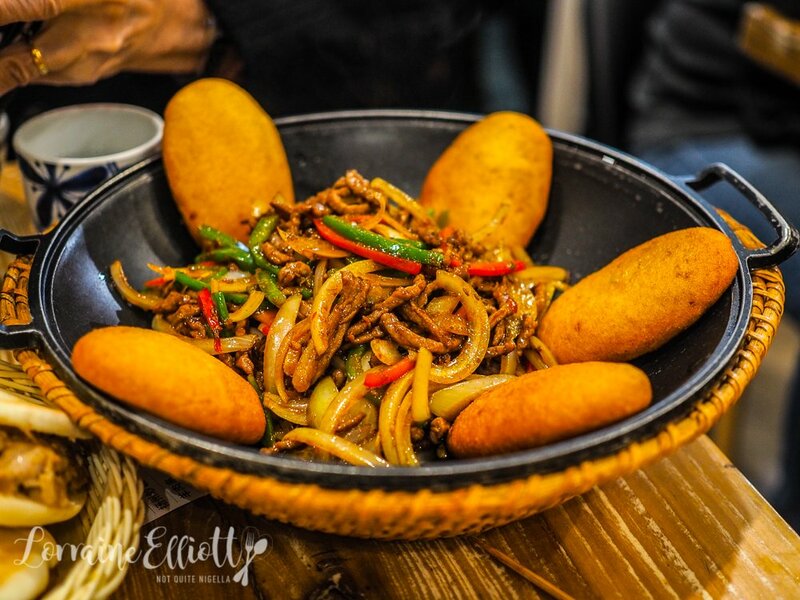 Imagine long, thick, slippery noodles dusted with chilli powder, meat on sticks, flatbreads, deep bowls of noodle soups dusted with chilli powder and lots of lamb dishes. 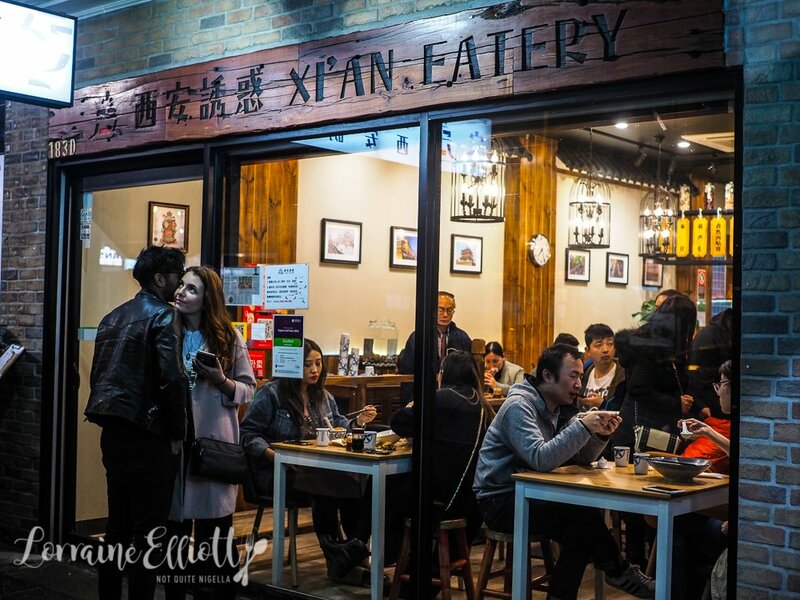 Xi'an Eatery is located on busy Burwood Road and we head there for Father's Day dinner one Sunday night. Even on a Sunday, Burwood Road is busy with lots of bright lights and an active social scene. We get to Xi'an (and be warned there are lots of places with Xi'an in the title so I accidentally booked at the wrong restaurant). The small restaurant doesn't take reservations and looks full apart from a couple of tables for two. Service from one waitress is sour and moribund and she tells me that I have to wait 15 minutes or more and fill in my name on the slip of paper outside. When there is no paper I go back in and another waitress smiles and tells us that we don't need to do that and that we should come right in and a table will be ready in a minute. Which brings me to a tip: arrive before 7pm because this is a popular place and at 7pm there was a large queue outside. Around us everyone is doing the biang biang stretch. That's taking a fat, long, slippery, chewy noodle and trying to wrestle it into your tiny bowl or mouth. It is said that one noodle is so long and thick that a single noodle would fill an entire bowl. Everyone orders these noodles but rest assured, nobody seems particularly expert at wrestling with them. Not from lack of trying I'm sure, it's just that they are hard to wrangle with chopsticks. We order these along with a host of other dishes that either look good or sound interesting. Ordering is done by flipping through a well worn menu and writing quantities next to a sheet that you fill out. It's like exam time but more delicious. "This may be too hot for you," says my mother to my father when the biang biang noodles arrive in all of their glorious, hand stretched glory. But he goes back for seconds and thirds he loves them so much. 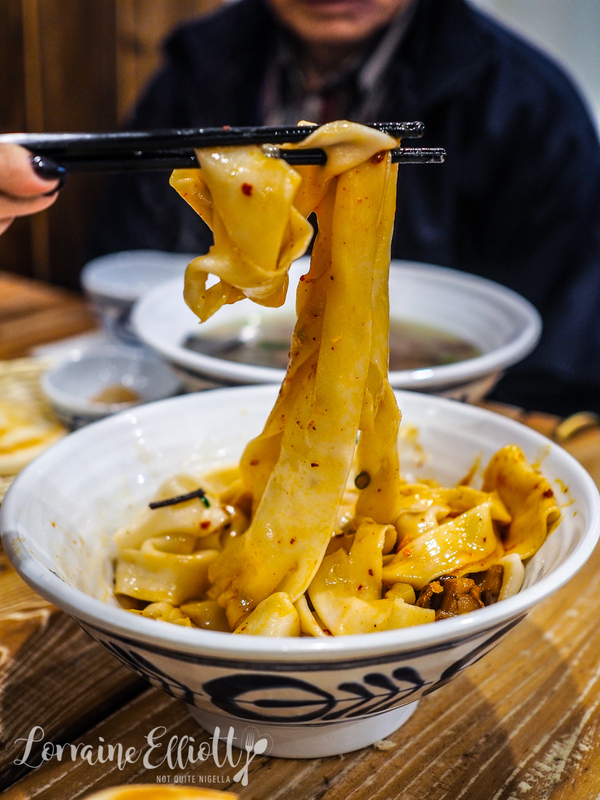 These noodles are called one of the 10 strange wonders of Shaanxi they're that popular. There's a layer of meat and vegetables which you stir up with the noodles but the texture of the noodles are the real star here. Forget our lipstick and forget going here for a first date (because I ended up with my lipstick on my cheek-ON MY CHEEK!). 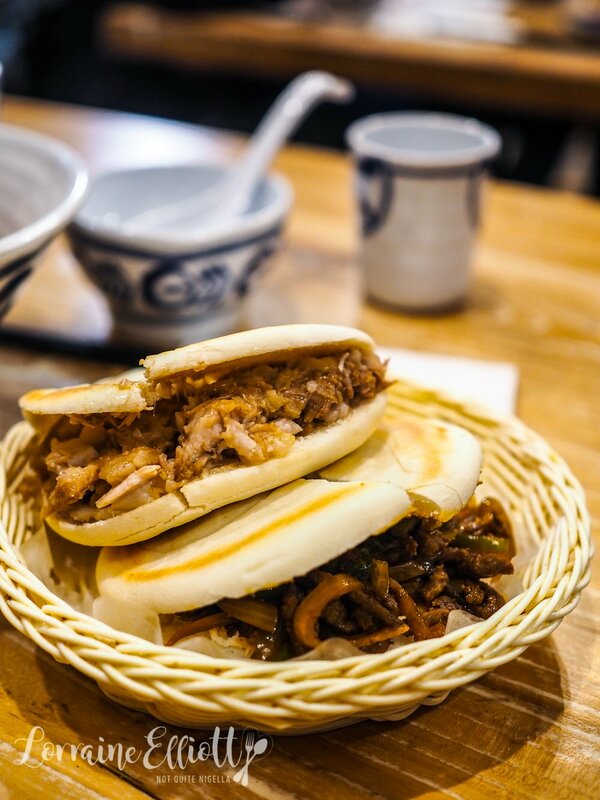 We also try the roujiamo or stuffed pocket Chinese hamburgers. There are two fillings: a hand pulled pork pancake as well as the lamb cumin one for comparison's sake. The pulled pork isn't the Mexican pulled pork, it's a soft roasted Chinese pork unctuous and cotton soft inside with plenty of fat in a soft plain pita bread. It's delightfully good and I could have easily had a whole one to myself. The lamb and cumin one is good but less exciting mostly tasting of vegetables. 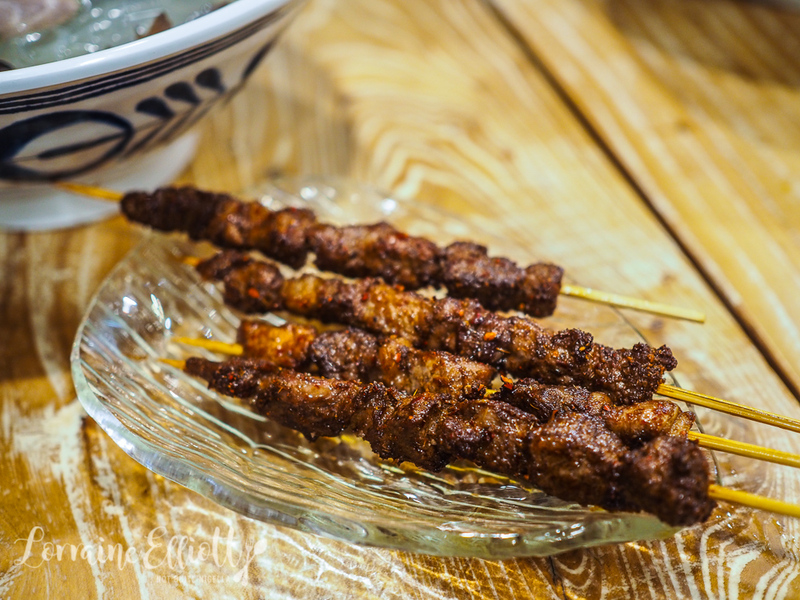 These are four small lamb skewers with plenty of spices and flavour to them. The spices prevent the lamb from tasting overly muttony. The other dish that was recommended is the lamb with vermicelli. Perhaps it was the fact that we ordered this to be not spicy so my father could eat it but it's too mild in comparison to the other dishes and tastes mostly of nutmeg. 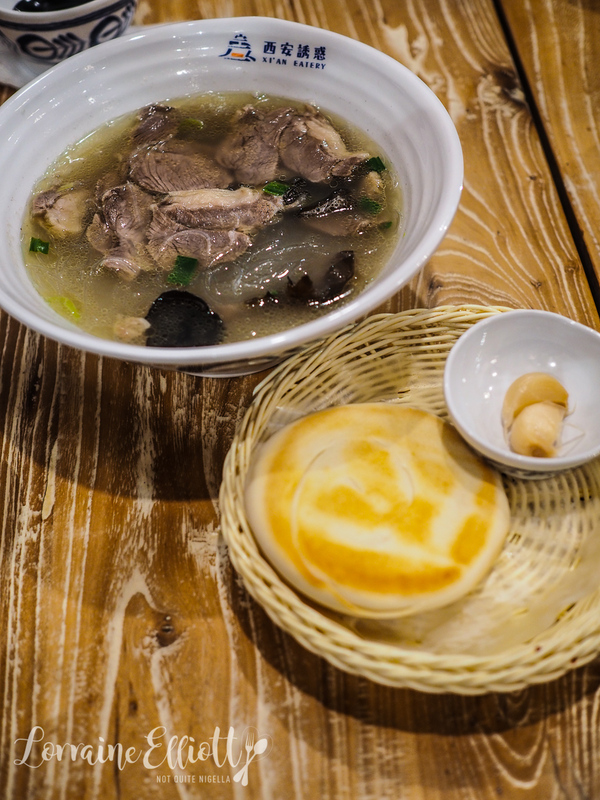 The pieces of lamb are tender and it's nice that it comes with one of those buns and the pickled garlic is delicious and not acrid but sweet and vinegary. But out of the two the biang biang noodles win by a silk road mile. The chicken wings are enormous-while the lamb skewers looked enormous in the menu photo, the picture of chicken wings belies how big this serve is. 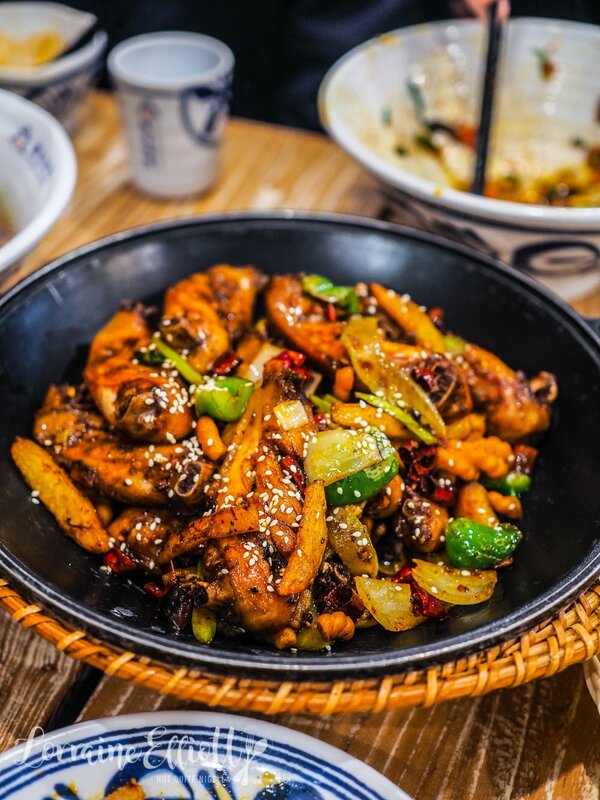 The chicken wings have the mala numbing effect with the Szechuan peppercorns and there are also little French fry potato chips and crunchy spiral biscuits among the chilli and garlic for a nice crunch. We also try the cold noodles. After the biang biang noodles these don't seem as exciting but when we come back to these thick, semi translucent noodles they grow on us. The food is quite oily so you do need to pace yourself a bit too. The last dish is a cumin beef stir fry with deep fried oval wholemeal breads. It isn't too spicy and this mixture is quite sweet. I actually like this in the pita bread that came with the vermicelli but it's also nice atop the fried bread too. And of course there is fried rice for my rice loving dad because while he enjoys noodles, no meal is complete without rice. 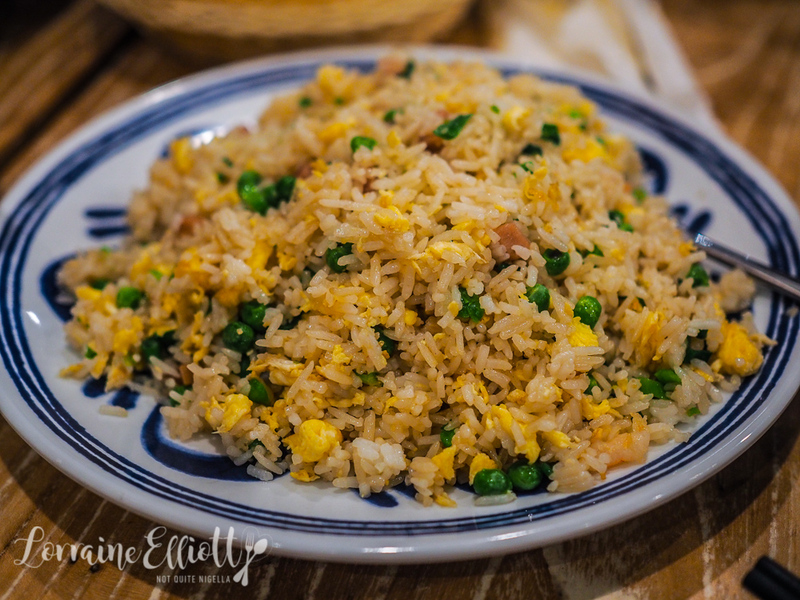 It's a good fried rice and reminds me of a home style version with plenty of ham and eggs. So tell me Dear Reader, is there something that you have to eat at every meal for it to feel complete? 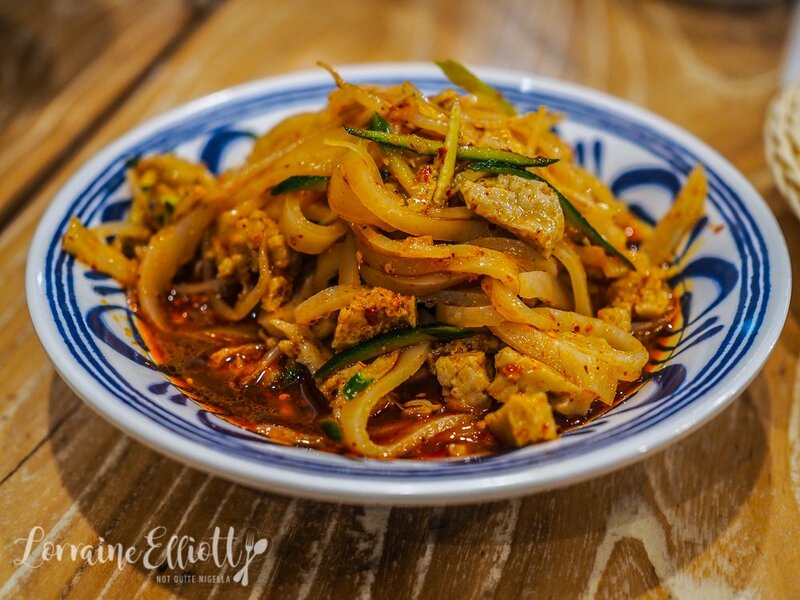 Have you ever tried Biang Biang noodles?